This product requires the base game Dying Light. Nothing like good old-fashioned law and order. 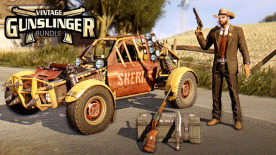 Fight crime as a sheriff armed with the Oathbreaker, the Onyx Thunderbolt, and the Deputy while you patrol your county in the Golden Bull buggy. The Vintage Gunslinger Bundle includes a new character outfit, a new buggy paint job, and blueprints for three new weapons: a shotgun, a revolver, and a long knife. Note: Buggy paint job requires Dying Light: The Following expansion pack. Laptop versions of graphics cards may work but are NOT officially supported.